When your golf club nestles in the "Garden of Ireland" and boasts not one or two but four Ryder Cup players among its most distinguished names, it's fair to say that it's a very special place indeed. But while Delgany Golf Club is rightly proud of the myriad accomplishments of the Ryder Cup men Harry Bradshaw, Jimmy Martin, Eamonn Darcy and John O'Leary, it's as a true members' club that it excels. Now in its 110th year, the club continues to look to the future with energy and optimism, and by the end of this season, it will boast a new short game area — designed by reGolf Design and built by DAR Golf Construction — having received a Sports Capital Grant of €65,500 towards the outlay. No doubt the learned hands of "the Brad" or "the Darce" would have loved to enjoy such a wonderful, 2,000 sq.m short game facility in their early days at the club, not that they were every found wanting with wedge in hand. Bradshaw's mastery of the short clubs is well known while few realise that Darcy was an early inspiration for the great Seve Ballesteros when he joined the tour with his pitching action as much a fascination for the Santander genius as his famous coin trick. “I would put a coin into his hand, and I would have a coin in my hand. And would say, I just want you to close your hand before I can take the coin out and put the one I have into your hand. There is just a knack to it. Darcy and Ballesteros are synonymous with the Ryder Cup in Irish eyes and the new "Ryder Cup 8" event — sponsored this year by Maxol and Wicklow Tourism — will be held in each Ryder Cup year from now on, alternating between Delgany and Balmoral. It's fitting that Delgany's captain this year is Jason Bradshaw, a grand nephew of Harry, who brought the club worldwide fame for his performances all over Europe and the world, most notably in The Open, the Ryder Cup and the Canada Cup. Of course, the club is steeped in history and the commemorative DVD it produced to mark its centenary in 2008, revealed many fascinating anecdotes. They include the tale of how the club’s first professional, Patrick J Doyle, was one of those lucky souls to miss the maiden voyage of the doomed SS Titanic in April 1912. Harry Vardon, who famously played an exhibition at Delgany with the great Michael Moran in 1909, also missed the trip because of ill-health but Doyle only failed to board the ill-fated liner because his train arrived too late. Doyle would eventually settle in the US, finishing tied 18th alongside Francis Ouimet behind the great Walter Hagen in the 1919 US Open at Brae Burn before going on to become a teaching professional the likes of former President William Howard Taft, the patriarch of the Kennedy clan, Joseph Kennedy, and world heavyweight champions Jack Dempsey and Joe Louis. He was also the grand-uncle of Darcy, who grew up near the club that offers such stunning views of the Sugar Loaf and the sea. 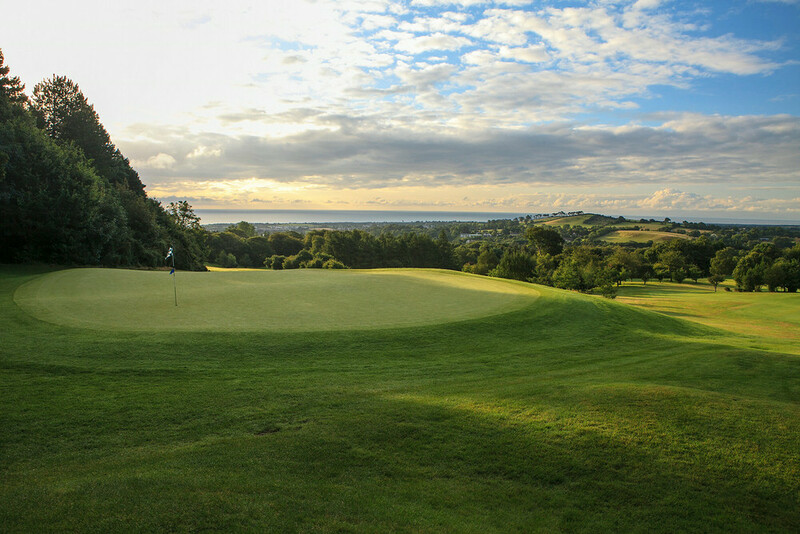 Set in leafy woodland, it is a family club with names such as Hayden, Walby, Martin, Darcy, Green, Bradshaw and others long connected with its verdant fairways and where every climb comes with the reward of another splendid view. Vardon made some recommendations about the course after he had beaten Moran by 3 and 2 over 36 holes in 1909, when he set out with only seven or eight clubs in his bag, famously remarking that “he drove like a lion but putted like a lamb” that September day. But the work on the course continues to this day. In 2004, the members invested €1.5 million on a significant upgrade of the layout, installing sand-based greens and tees to USGA specifications under the watchful eye of the late Patrick Merrigan, who was anxious to blend the newly constructed areas into the existing and natural contours of the course in order to make the new and old features indistinguishable. His work has stood the test of time, but Delgany has not remained idle and will soon boast an improved irrigation system to go with its new short game area and splendid clubhouse, which was revamped at a cost of €3.5m before reopening in early 2007. The club now boasts 980 members and 125 juniors, and with new 3,500 new homes being built in the club's catchment area, membership is very much in demand. The club is proud of its junior programme with its PGA professional Gavin Kavanagh, ably assisted by the talented Mark Staunton, playing important roles in its success. Gavin joined Delgany as PGA Head Professional in 1995 having completed the PGA Training Programme under the watchful eye of Gerry Egan and given the burgeoning junior progamme, don't be surprised if Delgany boasts some more big names to go with those Ryder Cup greats of yesteryear. Weekday €30, (€15 with member); Weekend €40 (€25 with member) with member. Nine holes 60% off. 16th “The Peep Hole”, 167 metres par 3. All downhill. Keep an eye out for the Bradshaw family plaque on the tee box. Play one less club and aim for the middle of the green. Don’t be short! Ordinary Full €1,870 (€200 Social), 5-Day Member €1,161 (€120 Social Levy), Senior Intermediate B (31-35) €1,050; Senior Intermediate A (27-30) €700; Intermediate (22-26) €450. Druids Glen, Druids Heath, Powerscourt, Bray, Greystones, Charlesland.